My blog post this week was supposed to be about a fractal sand castle in St. Croix. I’m headed there for a friend’s wedding and thought that it would be a good opportunity to add yet another fractal to the series. Unfortunately, my trip from the balmy Bay Area involved a short detour in Boston. Boston, of course, promptly got hit with the brunt of a major snowstorm leaving me stranded without much appropriate snow gear (although I did manage to buy a pair of boots shortly before the blizzard shut everything down). 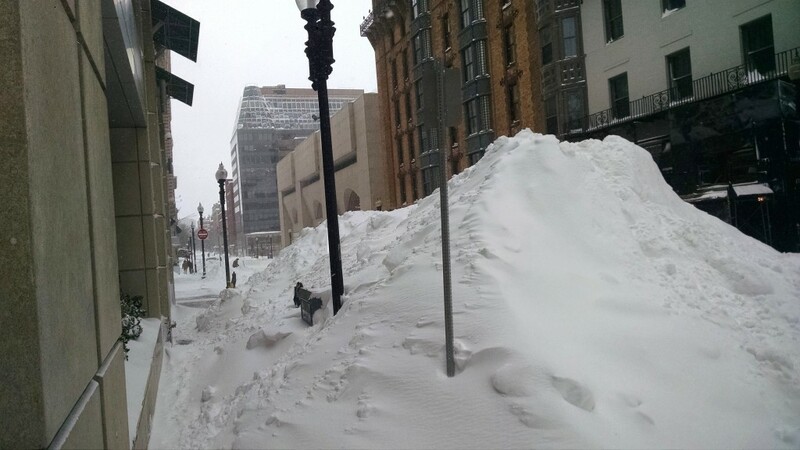 This snow pile on the side of the street is taller than I am. 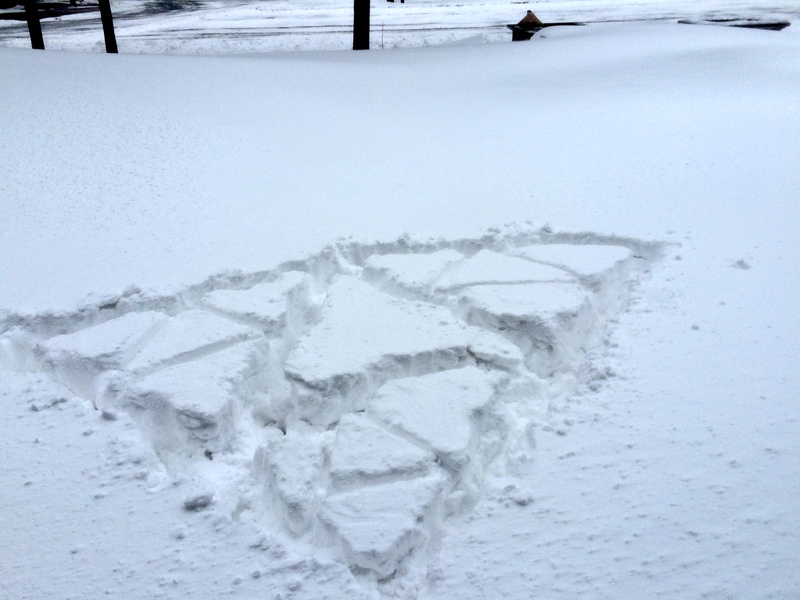 With no sand in sight, I decided to try tromping out a fractal in the snow instead. 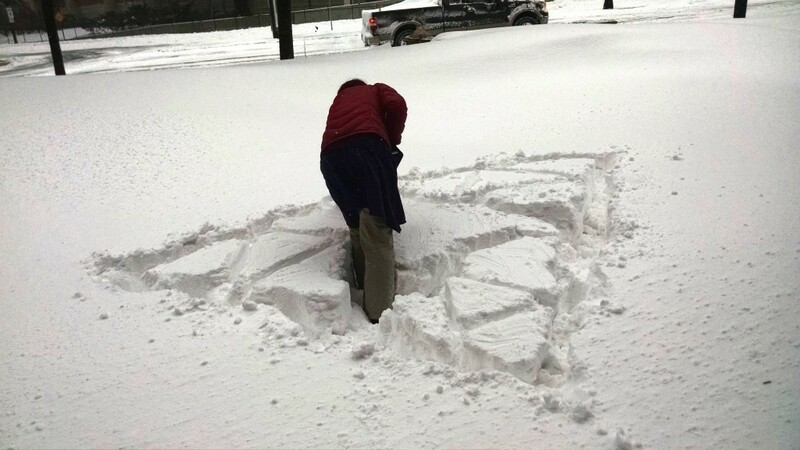 I think most fans of math art are already familiar with the fantastic snow art of Simon Beck (if you aren’t, go click that link now, DO IT). I was most assuredly not equipped to make anything of that caliber, but that didn’t mean that I couldn’t freeze myself trying to make a smaller scale attempt. And, conveniently, just outside my hotel, a glistening flat snow bank waited for me to stomp out my very own Snow-pinski Triangle. Tromp, sink, tromp. 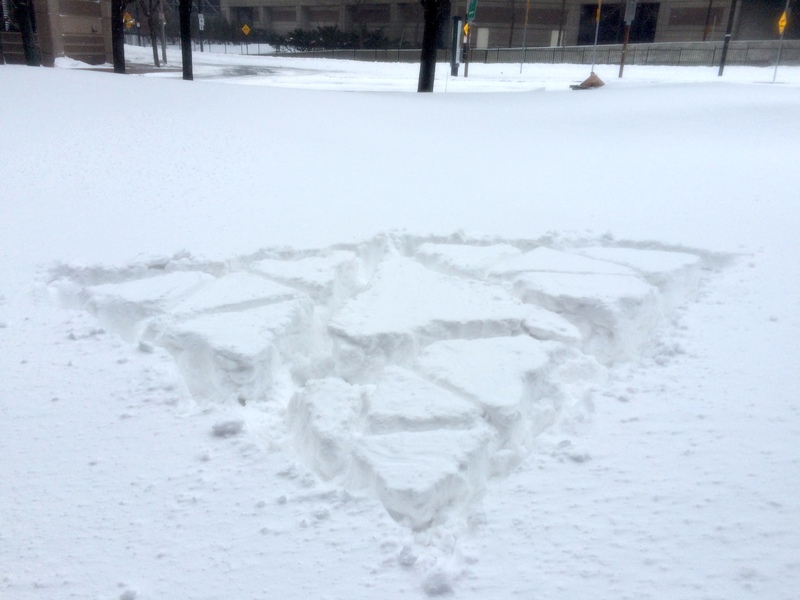 The snow-pinski triangle carved into the snow serves as a nice counterpoint to the sand-pinski triangle I mounded upon the ground a couple years ago. Although they share both a fractal structure and certain ephemerality, they also seem to represent opposite concepts. Summer and winter. Hill and hole. Land and water….. But I still wish that I was in St. Croix already. This entry was posted in Life on January 28, 2015 by hawksley. If companies wanted to be serious about getting even slightly more environmentally friendly (and save themselves money as well), they really ought to consider using less packaging. The amount of useless plastic being made just to securely package things in obnoxiously difficult to open clamshell packaging is rather mind-boggling. Fortunately, sometimes that packaging doesn’t need to just get thrown out. 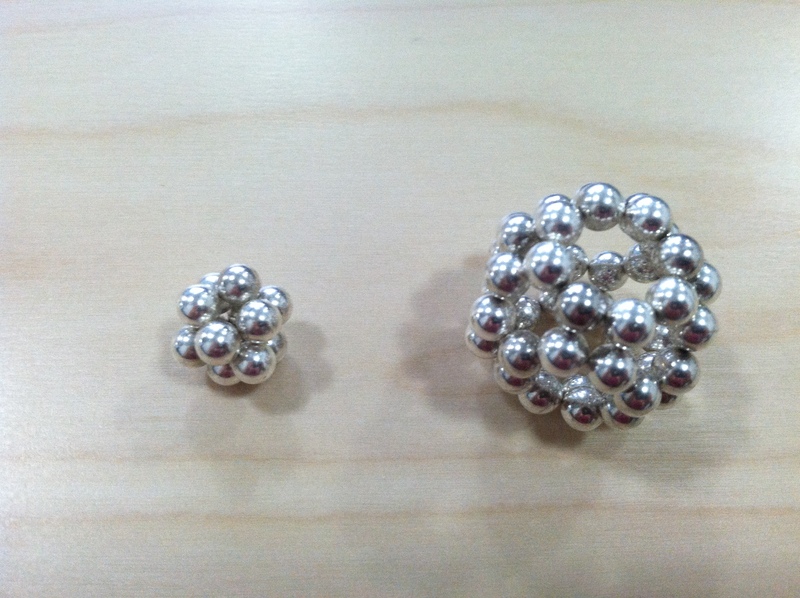 A couple years ago, shortly before people stopped selling them because of potential health risks to children, I bought a lot of those neat little magnetic ball toys. The packaging for these things was rather absurd. A large plastic box many times larger than the size of the balls contained within it. A few more plastic bits to keep everything held “just so” in the packaging. A small paper box with writing on it. 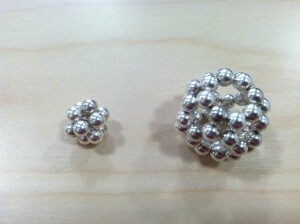 And, of course, a small sturdy plastic box to store the magnetic balls in. It wasn’t just over-packaging. It was, over-over-packaging. And it made it rather hard to get at the part you wanted to play with too. My friend Aviv Ovadya was over as I unpackaged them. As we fumbled with opening the packages, he proposed that we re-use some of the excessive packaging in math art (my friends are awesome like that). I know Aviv through origami circles originally, and I think we both share a bit of the origami “aesthetic”. In particular, neither of us wanted to cut attachment holes or just glue the boxes together and be done with it. Fortunately, I happened to have a large package of rubber bands handy, so we experimented with different non-damaging ways of connecting the boxes using rubber bands, settling on creating a nice icosahedral structure with 30 boxes and 40 rubber bands. If I’d made it more recently, I might have made a blog post about it then, but back then I rarely touched my blog, so that was the end of this particular diversion. The project might have been left undocumented forever, if I hadn’t realized a few weeks ago that the rubber bands holding it together had mostly disintegrated, and the structure needed to be trashed (boo!) or completely rebuilt. For the rebuild, I used small hair bands, which should last longer than regular rubber bands. The hair ties were also much more secure, so I only needed 20 of them. 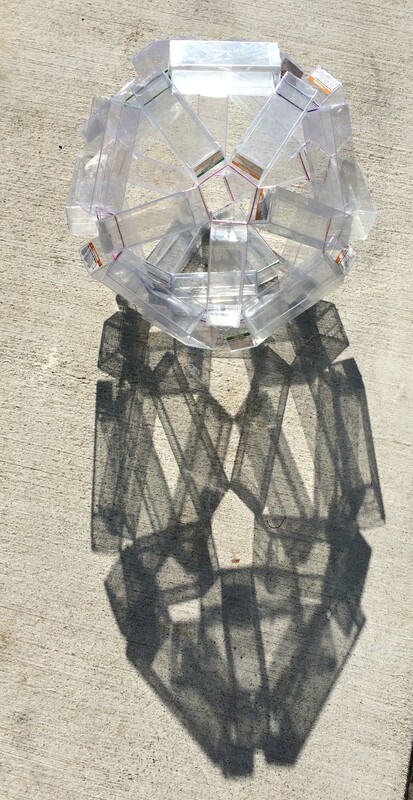 Probably the best thing about the transparent packaging material is how amazing the shadows through it look. 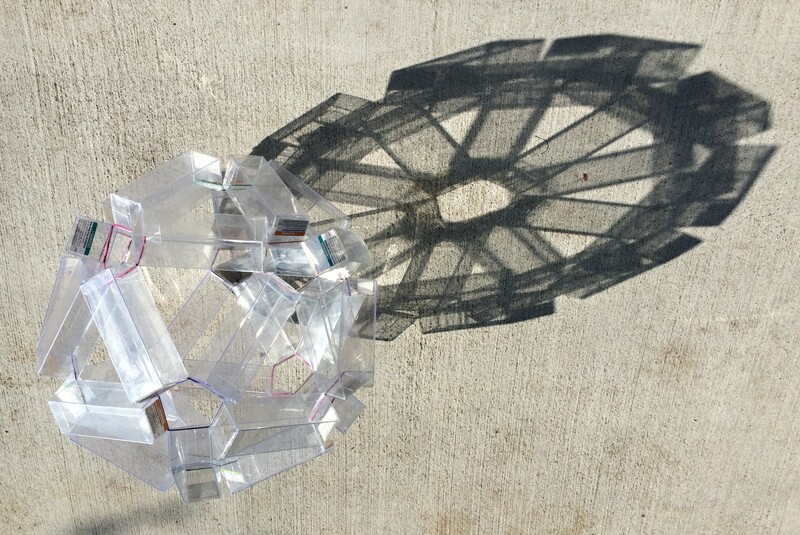 Regular geometric objects often have cool shadow projections, but I think the ones here are particularly spectacular. Do you have any packaging trash that could be transformed into something that might (like this) literally or figuratively overshadow the original packaging contents? 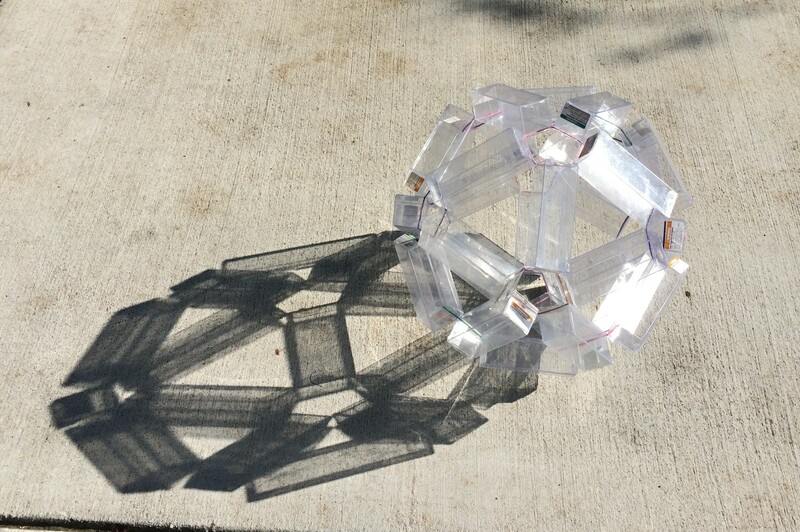 This entry was posted in Life, Math Art, Projects, Recreational Math and tagged shadows on January 22, 2015 by hawksley. 2014 has been a crazy and amazing year. I got an amazing new job, attended multiple math art conferences in Asia, and made all kinds of fun things. 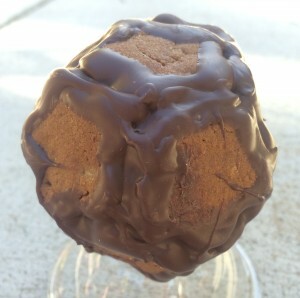 I thought I would end 11111011110* with an homage to my first post of the year on shortbraid and other geometric cookies, by making a regular polyhedron out of gingerbread and chocolate ‘glue’. The dodecahedron** is a particularly nice shape to close the year with because it has 12 faces – one per month! 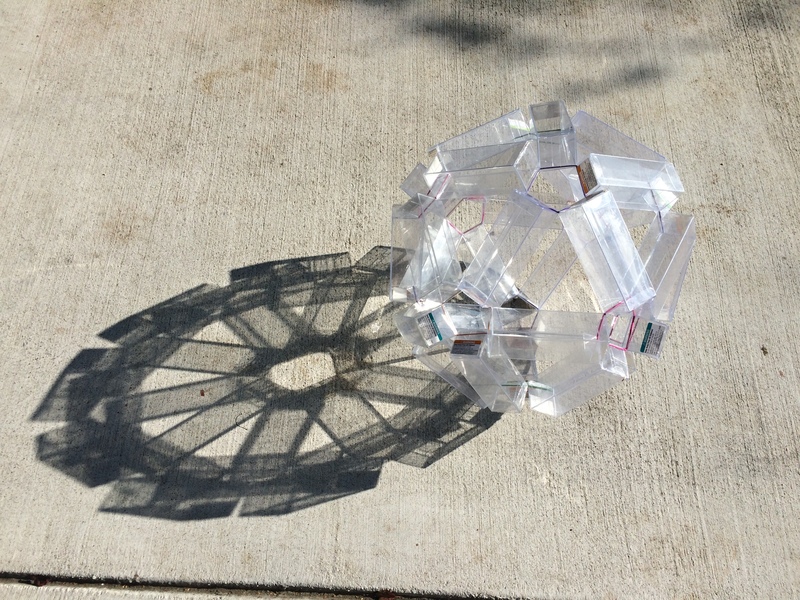 *** If you want a fun mathematical New Year project, you can make yourself a dodecahedron calendar. I considered doing a corresponding month by month round-up of my favorite posts, but I apparently didn’t bother to make a post last January. Instead, I leave you with my delicious and oddly healthy gingerbread recipe for anyone interested in making their own geometric cookies. Mix liquid ingredients and dry ingredients (except ginger chips) separately, combine. 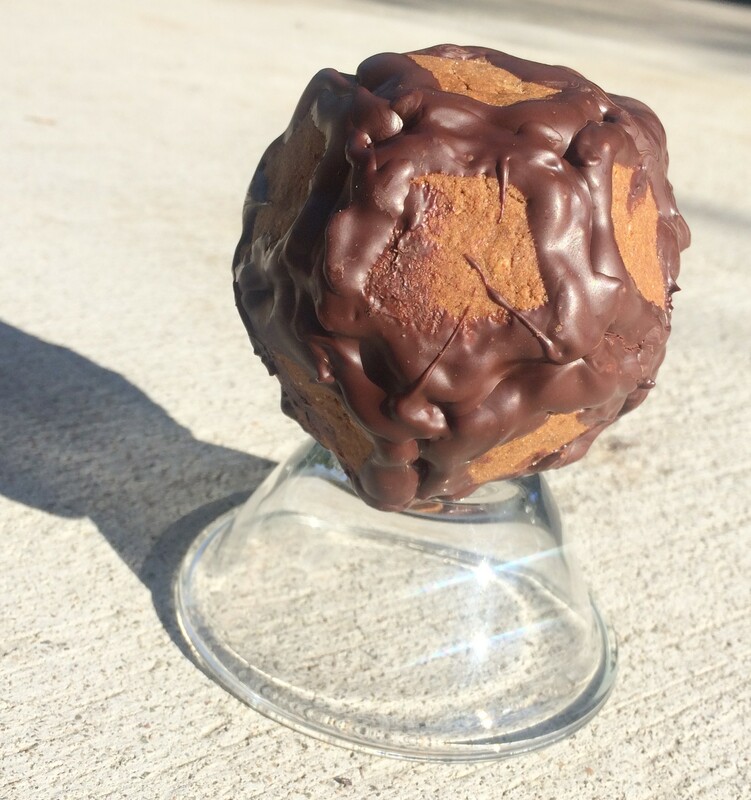 I use a Kitchenaid mixer for this. 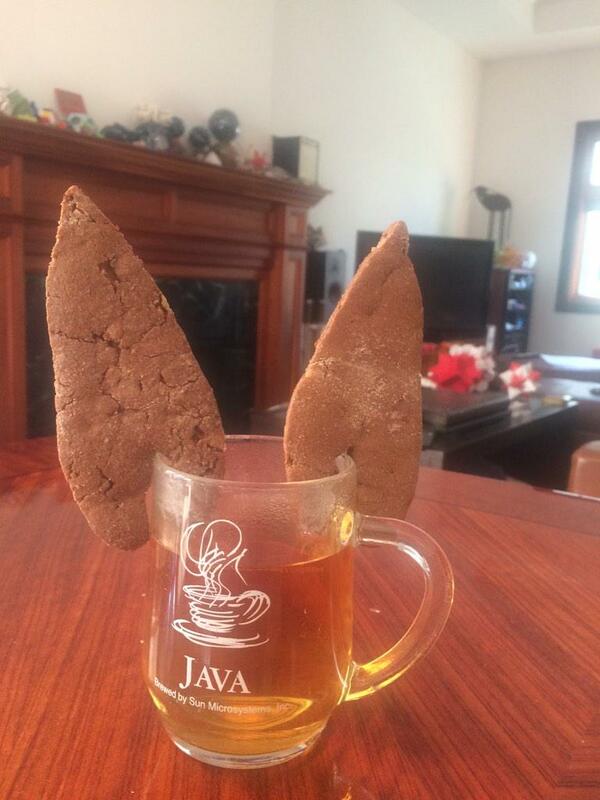 Mix ginger chips into dough. * I’m unreasonably excited that 2015 will be a palindrome in binary. ** It’s also my favorite platonic solid. 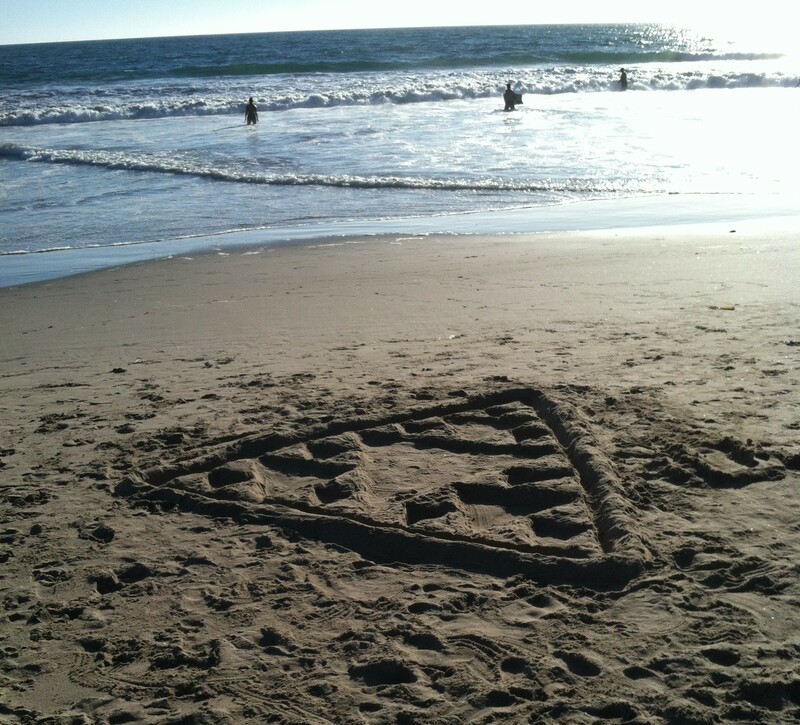 **** Yes, as you can see in the background, my house is kind of overflowing with random geometric constructions. This entry was posted in Life on January 1, 2015 by hawksley.